BROWN KRAFT Color PAPERBOARD with fibers naturally showing throughout each sheet. Because the organic products which are used in processing will vary, there is some variation in the resulting brown color. 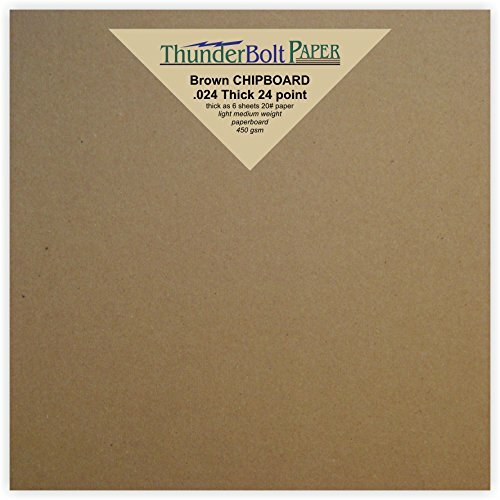 The SURFACE which is fairly smooth makes this paper fun to use in your own scrapbooks, albums, frames, displays, covers, backs, boxes and containers as well as for durable, natural, artistic works and other crafts. Protect your shipments. Add stiffness as chipboard backs for stand up display, prints, and notepads. Safely store documents and keepsakes. 100% Recycled paper board made with clean fibers, as good stewards of the environment. A great mix of recycling and processing of the fiberous materials to get a stiff chip board with a surface usable for most projects.